The metrics that Social Mention uses can be a little confusing if you’re not familiar with how the social universe measures itself. Say your company has released a new product and you need to know what people are saying about it. When you search for your product on Social Mention, the metrics for that search display on the left side of the browser window. The following sections detail what those metrics mean. Strength: This metric describes how likely your product is being discussed in social media. The way Social Mention calculates this is that it takes the number of mentions in the past 24 hours and divides it by the total number of possible mentions, giving you a percentage. Think of this as your “share of voice” in the social universe. 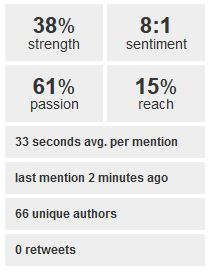 Sentiment: This metric is the ratio of positive mentions to negative mentions. Of course, you want more positive than negative mentions. This metric tells you if people are happy with your product or not. You can also see a breakdown of positive, neutral, and negative mentions right below. Don’t be surprised if you have a lot more neutral mentions than positive or negative mentions, and don’t think of neutral mentions as negative. Neutral mentions mean that people are still discussing your product! Passion: This metric gives you an indication of whether people are repeatedly mentioning your product. This can speak to people’s loyalty to your product or company. If you have a high passion metric, then you have people repeatedly discussing your product. Couple that with a high ratio of positive/neutral vs. negative mentions, then you must be doing something right! Reach: This metric tries to measure your influence; that is, the number of individuals who are mentioning your product. This is the flipside of passion. Reach is calculated by the number of unique authors divided by the total number of mentions. Ideally, you’d want to have high passion and high reach, because that would mean that you have a whole lot of individuals mentioning your product repeatedly. However, if your reach is low, but your passion is high (as in Figure 1), then you probably have a smaller group of admirers who are talking a lot about your product. In this case, it’s time to focus on reaching more people. Figure 1: The four main metrics — strength, sentiment, passion, and reach. Below the four main metrics are a few other helpful bits of information that can help you tell how your product is doing in the social universe. Average seconds per mention: This metric tells you the average time between mentions of your product. If your product is being mentioned every 33 seconds, as in Figure 1, then you probably have a pretty hot product! Last mention: This is self-explanatory and also speaks to the popularity of your product. Unique authors: This metric relates to the reach metric. This is the actual number of individual authors who are mentioning your product. Retweets: This pertains to Twitter and tells how many times Twitter posts about your product have been reposted or forwarded on Twitter. If you’re not getting retweets, it may be time to step up your own efforts on Twitter. In general, metrics are actually pretty meaningless on their own. But when you combine them and apply reasoning to what you’re seeing, then you can begin to tell a story. And from the story you tell, you can come up with an action plan to improve performance.